Mike Martin from RFI Services is using an UHF receiver and antenna to accurately locate the source of RFI. The antenna system, that I remind you is an electrical system once powered by your receiver or your transmitter, is constituted of the coaxial, the feed line and the antenna itself. Due to the current and voltage flowing in these wires and other element, each of these components is able to capture not only RF signals emitted by amateur stations but also artificial "noises", interferences that will be transmitted to your receiver, generating this well-known background noise that you hear sometimes on bands. Where does all that noise come from ? Excepting natural emissions (mainly from the Sun and cosmic sources), any generator of electrical energy is a source of interferences in the electromagnetic spectrum, and for our concern, in HF bands; this is the famous RFI. For decades we have identified these sources of noises : aerial high power lines, distribution power lines, leaks from insulators, air-conditioners, battery chargers, TL-lamps, triggers, computers, screens, transformers, dimmers, VCR, and many other devices. All generate noise, harmonics, from the moment they are not protected. But don't forget that the Sun is the main source of parasits. If you doubt of the origin of the RFI make a test in working on the air at night if you experiment much QRN at daytime : that should be a world apart ! 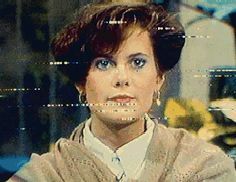 However, if you experiment strong background noises (up to 28 mV or S-9 on your S-meter) covering most of QSOs like signals beating at a high rate, interferences occuring only at daytime or a very strong signal in a narrow bandwidth of a few kHz, and of course parasists (EMI) watching TV like on the image displayed at left, you are more than probably capturing signals of man-made origin. Hopefully all problems have a solution. Only one recommendation, work systematically. You will find hereunder an excellent review of this problem and how to solve it. It is a video made by Industry Canada. It is available in English and in French. Video : How to identify and remove RFI ? Is my installation a source of RFI ? To try locating the origin of the signal (or noise) is already a huge task in terms of time consuming and sometimes in searching a suited receiving equipment (portable antenna and receiver) if you ham shack isn't fill yet of receivers or transformed in a true electronic repair desk, Hi ! If you are isolated it can be useful to contact your nearest radio club to get some help. Among his members there are probably some electricians or engineers specialized in RF equipments or still better knowing very well the RFI problem. To know if your installation generates narrowband RFI, listen to the HF bands is search of strong and persistent RFI emitters. Once picked up, with the help of another person, it is easier, disconnect one after another the electrical devices plugged in your shack and the nearby rooms, and listen again... You can also use either a portable AM receiver on battery or a portable AM receiver working on 12V and a whip antenna, and walk in your home in search of the gulty device. Of course such method will not work with broadband RFI emitters that pollute all bands. 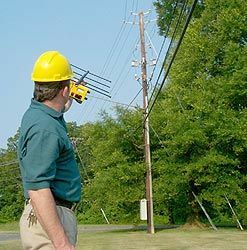 If the emission come from the outside you can use an UHF handheld receiver and a small Yagi 4-element like the ones used in Fox hunting ham activities. If you succeed in locating your RFI source, you have still to suppress these interferences, another big affair ! If you locate immediately the gulty device, it is fine (e.g. a transformer, a battery charger, a defective outlet, a display) but generally these RFI come from the outside, another appartment or a system installed in your neighborhood, private or public. Of course I do not discuss here about noises generated by BPL/PLC systems that I describe in another page, and that we are actually legally unable to reduce or to remove from amateurs bands. You have to follow a strict investigation procedure to avoid searching for example so-called gulty devices that are more than probably out of cause or too far away to produce the RFI that you experiment. In a first time The ARRL RFI Book displayed at right should be your bedside book for a while. 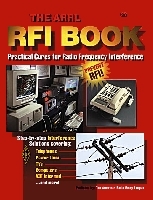 It deals with most peripherals sources of RFI (power lines, TV, computer, intermodulation, etc) and provides step-by-step procedures to reduce or remove them. Sometimes the RFI source is located in a nearby property. It might come from an electric fence or an automatic garage door. Few users know that some of these models create interference in HF bands. These signals are pulsed in nature (fences use HV coils or transformers, sometimes thermostatic devices, garage doors use RF), and a noise blanker like MFJ-1026 which was effective against the "Woodpecker" HF Radar and alike will be effective in this case as well. There are probably in your country dealers who sell fence chargers which emit no RFI. Usually models using continuous HV charge with current limiting do not create RFI; their charging pulses are shaped to prevent it. In all cases, such an interference is against radio regulations, and there are legal recourses which can be pursued if all else fails. In this case it belongs to your neighbour to modify his installation to prevent new RF interferences in your equipment in the future. Without legal prosecution, this action can be undertaken or not as it implies financial investments for your neighbour that his is probably not ready to do. Usually you know the technical problem better than him. Like the assembling of a tower near the house of your friend can disturb him and create some neighbourhood problems, I warmly suggest you to talk quietly of this problem with him, to show him your hamshack, to explain him what you do, make a QSO together, etc, instead of placing him in front of the "fait accompli". To prevent any trouble, it is by far preferable that you help your neighbour in suppressing his RFI, even if it means doing some investigations at his place. You both will learn much from this experience and, still better, you will stay in good terms with him. What receiver to use for tracking RFI ? If you don't use the previous Zapchecker or PCE EM-30 magnetometer to detect the RFI or EM fields, for close-in tracking (Dfing) of a wideband noise source, you can use any receiver that is fairly high in frequency. The AM aircraft band between 108-135 MHz works well and inexpensive receivers are available in that purpose. Several portable shortwave receivers like the Radio Shack model display at right have also an AM airband reception. Another alternative is a couple of portable VHF receivers from Radio Shack that feature AM aircraft reception. 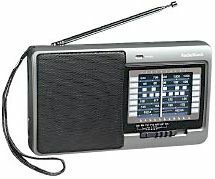 Radio Shack receiver 12-756 (VHF-AM, TV bands and weather stations) for DFing RFI. Model 12-456 retails at $35 (maybe sold out), model 12-756 sold for $42 or the handheld model 12-615 sold for $25 will satisfy you. These receivers do no have a coax connexion, but you can simply connect the center conductor of your antenna coaxial feed line to the receiver antenna plug with a clip lead or any other mean. Connect the shield of the coax to a case screw. Of course if your neighbour or his adviser refuses to listen at your suggestions and takes legal dispositions, contact immediately your national amateur radio association. They have more than probably already been confronted to similar problems and could provide you some advice and help you to solve your neighbouring problem. In the negative contact your P&T administration but be first updated with your license, your equipment and the respect of the regulation so that you have all "trump cards" in hand and not be deserved by your own installation... To achieve this objective, here are some advice to get a performing RFI free installation.